The quake struck 233 miles west-southwest of Hagatna, Guam, and was 2.9 miles deep in the earth's crust. Did you feel the quake? Share your story or images with CNN iReport. The Pacific Tsunami Warning Center did not issue a tsunami warning after the quake, which struck at 7:19 a.m. Saturday (5:19 p.m. ET Friday). "We wouldn't expect any kind of significant tsunami for this event," said the center's director, Charles McCreery, noting that the quake's magnitude was relatively low to provoke one. There were no immediate reports of casualties or damage, emergency management officials said. 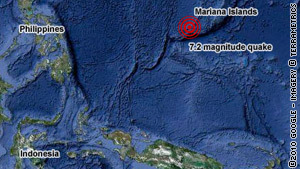 The quake struck about 375 kilometers (233 miles) west-southwest of Hagatna, Guam, and 445 kilometers (276 miles) west-southwest of Rota, Northern Mariana Islands. It ran 4.7 kilometers (2.9 miles) deep. CNN's Dan Gilgoff and Talia Kayali contributed to this report.